The easiest way to help improve your fuel economy, while prolonging the life of your tires and keeping your family safe, is to check your tire pressure once a month. 3 out of 4 drivers wash their car at least once a month. It is a perfect time to check your tire pressure and you won’t even get your hands dirty. The natural porosity of rubber can cause tire pressure to drop by as much as 2 psi (pounds per square inch) monthly. Adding to this, seasonal temperature swings can also result in significant changes to tire pressure, making regular checks in winter even more important. Every 5°C change in temperature results in approximately 1 psi change in tire pressure. This reduced tire pressure will only add to the rolling resistance caused by snow and slush. In winter tire pressure is also critical to handling, especially for vehicles equipped with low profile tires. Maintaining the correct tire pressure is also an important safety factor due to the load on your tires. The correct pressure will carry the load with no problem, however a low tire pressure will weaken the tires and can eventually lead to failure. When a tire is low it is forced to stretch beyond its designed elastic limits and this weakens the bonds between the various layers and materials. When a tire is overfilled, it will result in handling and braking performance. Studies estimate that just one tire under inflated by 4 psi can cost you 2% more in fuel consumption. Both over and under inflation will result in reduced tire life, poor vehicle handling, and can lead to sudden tire failure on the road! Studies also show that even though 90% of Canadians acknowledge that tire pressure is important to both safety and fuel economy, but 70% of vehicles surveyed had at least one tire under inflated. This means that there are a majority of drivers that are sacrificing not only fuel economy, but handling, tire life, and in some cases safety. This lack of simple maintenance costs Canadians almost 400 million litres of fuel and adds over 1 million tonnes of CO2 to the atmosphere every year. Check your tire pressure monthly and always before you leave on a long trip. If you are loading your vehicle for traveling or are pulling a trailer, you may want to increase your tire pressure to handle the extra load, but never exceed the maximum pressure indicated on the tire sidewall. Tires are very important for your safety, so if at any time you have any concerns about your tire, get them checked. If you feel that you vehicle is not handling the way it should or feel vibration in the steering wheel, or if the vehicle pulls to one side, check your tires immediately. It may not be the problem, however it is a good place to start looking for the problem. You could extend the time between checking your tire pressure to 3 months by having your tires filled with nitrogen. Nitrogen molecules are larger than oxygen and this slows the pace of leaking through the rubber. Want to know more? To be accurate, measure the pressure when your vehicle has not been driven for at least three hours and the tires are cold. Air expands when heated and even driving a kilometer will warm the air in the tire and increase the pressure that you read. Always follow the recommended tire pressure indicated on the tire information sticker that is usually located on the driver’s side doorframe. 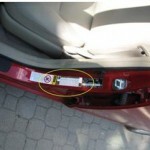 If it is not there, check the glove box, visor, or fuel door. The maximum tire pressure indicated on the tires is the pressure required to carry the maximum load and is not usually the same as the manufacturer’s recommended pressure for your vehicle. Remove the cap from the valve stem and take the pressure reading. Add or remove air as required. See below for more information on adding air. In colder weather, let some air out of your tire first before filling the tire. This will help to remove any moisture from around the valve stem, reducing the potential for the valve freezing and leaking. It is a good idea to check your tire pressure at a service station, especially in winter, just in case you encounter a problem. Always keep the valve stem covered with an appropriate cap to keep moisture and debris from accumulating around the stem. Don’t forget to check the tire pressure in your spare tire too, you never know when you’ll need it! • Your recommended tire pressure is 32 psi. • The reading you took “cold” was 29 psi so you are 3 psi low. • When you arrive at the service station your tire pressure is 31 psi. Remove the valve cap again and add air. Check your tire pressure again to ensure that you have added the enough air. If not add and check again until you have reached the required level. If you have over inflated, use a sharp object to press in the valve to release air as required. 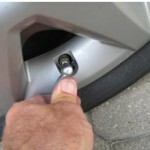 Want to see a video on how to check your tire pressure? Click here!